Races Start at 7:00 p.m.
Must Be Purchased in Advance! 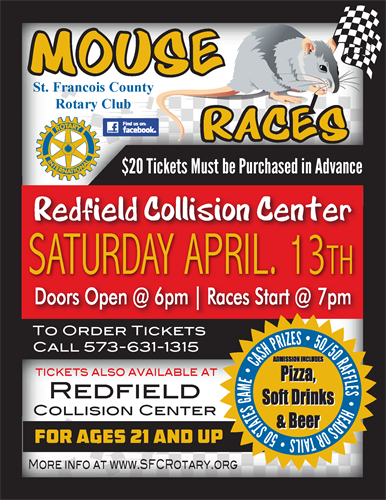 The Annual Rotary Mouse Race is coming! The 9th Annual Rotary Mouse Race is ramping up to be another GREAT night. Get your tickets in advance from either Redfield Collision or from any Rotary member for by calling or texting Curtis at 573-631-1315. Tickets are LIMITED and must be purchased in advance! Doors open at 6:00 p.m., Races start at 7:00 p.m.
Tickets include pizza, soda, and beer but you are welcome to bring in your own snacks and drinks if you would prefer. There will be multiple 50/50 drawings, raffles, heads or tails, the 50 states game, and, of course, the crowd favorite, Rodent Roulette. Get there early to get good seats and entered into the great drawings!